Civil cases in the Supreme Court of British Columbia usually involve claims exceeding $35,000. Claims of $5,000 or less will go through the Civil Resolution Tribunal process. However, beginning April 1, 2019, most claims involving a motor vehicle injury valued $50,000 and under will be dealt with in the CRT. Most non-motor vehicle related claims between $5,001 and $35,000 will be heard in Small Claims Court - a division of the Provincial Court of British Columbia. 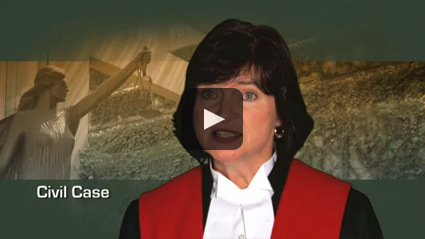 The Supreme Court also hears cases involving civil matters such as bankruptcy, personal injury claims and contract disputes, as well as judicial reviews of administrative tribunals like the Worker’s Compensation Board. Cases of libel, slander and malicious prosecution are also heard in this court. Typically, to start a civil claim, a plaintiff or petitioner files a Notice of Civil Claim or a Petition (see Getting Started). The defendant or respondent must then reply in order to dispute the case. Claims at the Supreme Court may be heard by judge or jury, however most civil cases in the Supreme Court are heard by a judge alone. A jury in a civil trial has only eight members and they do not have to reach a unanimous decision, as long as 75% (or six out of eight jurors) agree on the result after at least three hours of deliberation. In either case, judges or juries will listen to both sides, weigh the evidence, and make a decision in favour of the party who can convince the court that their side of the case is more probable. The principle behind this is known as proving your case on ‘the balance of probabilities’. It is different from the type of proof required in a criminal case. If a plaintiff is the successful party in a civil trial, the judge will award damages to the plaintiff (see After the Trial).The jury can also make decisions on the amount of damages awarded in a case. If the defendant is the successful party, then the claim will be dismissed. The Justice Education Society has produced a series of Civil Guidebooks to help British Columbians bring their case forward in Supreme Court. The guidebooks provide information about civil, non-family matters – they do not provide advice. Before moving forward with your civil case it is helpful to be aware of the legal challenges ahead. This section provides a series of guidebooks that describe an overview to the Supreme Court process, alternatives to court, as well as how to get legal help and how to prepare before you meet with a lawyer. Civil cases in Supreme Court start with a Notice of Claim or a Notice of Petition. This section provides information on starting and responding to a lawsuit. In addition, there are guidebooks that describe fast track litigation, discharging bankruptcy and appealing Small Claims Court decisions. Before your case goes to trial, there are other court processes. You may need to learn about how to settle your case, making chambers applications, the discovery process, case planning conferences and requisitions. If you and the other party cannot settle your dispute, you will need to prepare to go to trial. This section provides information about judicial review, court protocol and how to prove your case. Once you have a decision, you will need to learn about court costs, drafting orders and enforcing orders. Where are you in the court process?